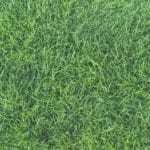 Primary Grass Affected: Creeping Bentgrass, Annual Bluegrass, Kentucky Bluegrass, Ryegrass, Bermudagrass. Brief Description: Fungal disease that causes small patches of dying lawn the size of a silver dollar. Dollar spots are a common fungal disease that tends to affect golf courses, but may also infect manicured home lawns. Unlike some fungal infections, dollar spots do not damage the roots or crowns of grass. They only grow on the blades/leaves of grass stalks. 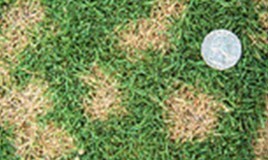 Dollar spots spread through more times of the year than other lawn diseases because they can grow in a range of temperatures. 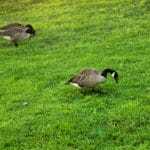 While they are more prolific when the air is moist or humid, they spread when temperatures are anywhere from 56 degrees to 86 degrees – a range that allows them to thrive all the way from early spring to late fall in warmer climates. Kentucky bluegrass may also be more susceptible to Dollar Spot and cause larger patches in less time. As the name implies, dollar spots are small and round-ish patches that resemble the size of a silver dollar on average, but may range to over 6 inches wide. 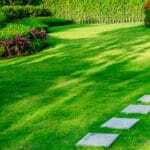 Dollar spots are often overlooked long before they grow into a serious problem, especially on home lawns where the infections maybe small at first and appear like a tiny dead spot on your lawn. Many believe that dollar spots are nothing more than urine patches left by an animal. If you look at a blade up close, dollar spots become easier to recognize. The blades themselves exhibit several common symptoms – the most notable is the white mycelium that grows on the affected area in the morning before fading to the brown and tan color. There is often a purple or light brown color that goes down the blade. Aeration – Strong roots make grass less susceptible to the fungi. Nitrogen Fertilization – Strong nitrogen levels reduce the likelihood of Dollar Spot. Proper Mowing – Mowing grass too short increases the risk of Dollar Spot. 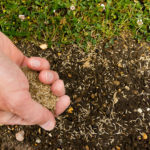 Proper maintenance is often enough to prevent this lawn infection, but because proper maintenance is difficult, many choose to use fungicidal prevention treatments.